Mongolia is working with overseas investigators to investigate claims of corruption at its giant Oyu Tolgoi copper mine. This is following the re-arrest of a former minister suspected of “abuse of power”. S.Bayartsogt was first arrested last April and released in June following a probe into the 2009 negotiations over the mine’s development. The mine at the time was then owned by Canada’s Ivanhoe Mines and is now managed by Rio Tinto, which is an Anglo-Australian mining corporation. S.Bayartsogt, a former finance minister, was among the signatories to this investment agreement, which was approved by Mongolia’s parliament. T.Munkhtungalag, who is a spokeswoman with the country’s Independent Authority against Corruption (IAAC), told Reuters it was now conducting a thorough financial investigation into the allegations that would be international in scope. She did not mention which other countries the IAAC was working with. The mine, which has been run by Rio Tinto since 2010, is central to the firm’s push to reduce its reliance on iron ore sales. However, the corporation has faced a series of wrangles with the Mongolian government over tax payments and cost overruns. Expansion plans will make Oyu Tolgoi, located near the southern border with China, one of the world’s biggest copper mines by the early 2020s. E.Idertsog, who is the IAAC’s head of investigations, said the authorities were looking into allegations that the ex-minister, who is one of six people now being investigated in the case, “gained a large amount of money by selling shares when prices went up after the signing agreement”. He didn’t identify the foreign company. Bayartsogt was re-arrested on January 16th. According to his assistant, the former minister, who has previously denied all charges, is now in custody, and unavailable for comment. His assistant and lawyer both declined to comment further . The 2009 deal gave 34% of the Oyu Tolgoi copper-gold project to the government of Mongolia, with the remainder held by Ivanhoe, now known as Turquoise Hill Resources. Turquoise Hill is now 51%-owned by Rio Tinto. Turquoise Hill and Rio Tinto both declined requests to comment. According to Reuters, the Swiss Office of the Attorney General (OAG) is conducting a separate criminal investigation into a seized bank account that court documents indicated was used to transfer $10 million to Bayartsogt in September 2008. 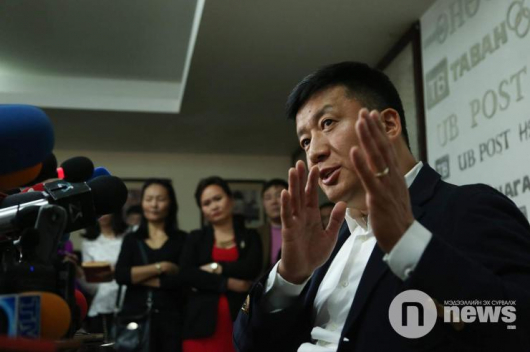 SME Fund scandal: was Mongolian PM involved? S.Zorig murder case: Were defendants tortured to confess? All rights reserved 2018. Copyright - NewsMN.